206 pages | 13 B/W Illus. Human beings are grieving animals. ‘Consolation’, or an attempt to assuage grief, is an age-old response to loss which has various expressions in different cultural contexts. Over the past century, consolation has dropped off the West’s cultural radar. 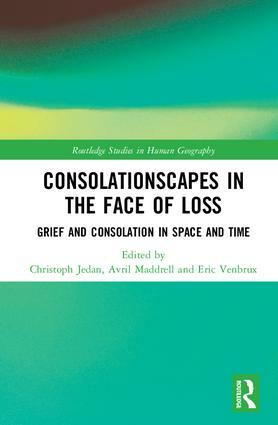 The contributions to this volume highlight this neglect of consolation in popular and academic discourses and explore the usefulness of the concept of consolation for analysing spatio-temporal constellations. Consolationscapes in the Face of Loss brings together scholars from geography, philosophy, history, anthropology and religious studies. The chapters use spatial and conceptual mappings of grief and consolation to analyse a range of spaces and phenomena around grief, bereavement and remembrance, comfort and resilience, including battlefield memorials, crematoria, graveyards and natural burial sites in Europe. Authors shift the discussion beyond the Global North by including responses to traumatic grief in post-conflict African societies, as well as Australian Aboriginal traditions of ritual consolation. The book focuses on the relationship between space/place and consolation. In so doing, it offers a new lens for research on death, grief and bereavement. It offers new insights for students and researchers interrogating contemporary bereavement, as well as those interested in meaning-making, emerging socio-cultural practices and their role in personal and collective resilience. Christoph Jedan is Professor of Ethics and Philosophy of Religion at the University of Groningen, the Netherlands. Avril Maddrell is Professor of Social and Cultural Geography at the University of Reading, UK. Eric Venbrux is Professor of Comparative Religion and Director of the Centre for Thanatology at Radboud University, the Netherlands.